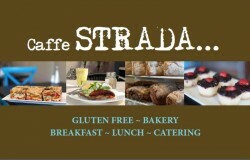 Caffe Strada is a gluten free bakery and cafe. With real flavour and good sourdough texture, and baked in a dedicated gluten free environment, it's a real winner! The Bread is currently available in a number of Restaurants, Cafes, Takeaway outlets and health food shops through out Melbourne, Victoria and Sydney. Paul and team of bakers are always creating new bread types and styles. An up to date list is available here. The caf menu offers a healthy selection of breakfast, ranging from kitchen made Kapai Puku muesli, black rice pudding with seasonal fruit and organic yogurt, or Paul’s favourite black pudding & manchegio cheese omelette. The lunch menu has some new dishes - ham hock croquettes with hommus & sweet pickle, yellow fin tuna super food salad, marinated chicken & summer citrus salad, Timorese lamb satay with coconut rice & paw paw salad, and the old favourite battered barramundi fillets, garden salad, chips & dill aioli. To finish off lunch you can choose from the fresh cakes, slices and pastries made every day. The cafe's atmosphere is warm and inviting, with an Edwardian timber fire place and earthy colour scheme. There are comfortable two toned Banquettes, timber chairs and a rustic recycled timber counter, with a display case full of cakes, slices and filled turkish ready to grab and go. There are alfresco tables on the street and outdoor seating in the courtyard. Caffe Strada is fully licensed, offering a popular catering service, and either pick-up or delivery can be arranged.